It’s all about the family: Mayor George Brticevic and Warren Morrison at last night’s Sleeping Giant 21st birthday party. 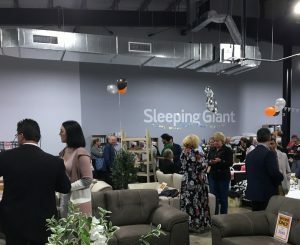 For the past two decades a lot of people in Campbelltown and Macarthur have been sleeping on beds they bought from Warren and Sue Morrison’s Sleeping Giant store. 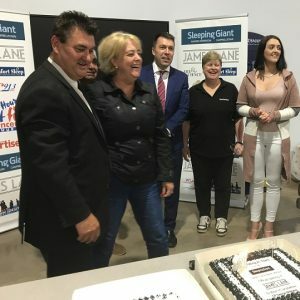 In the next few years they will also be eating on tables and relaxing on lounges from this successful local business that last night celebrated its 21st birthday. 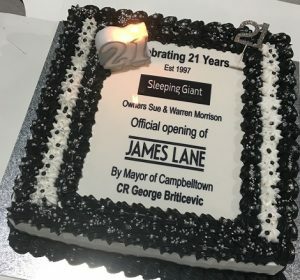 As part of the celebrations Warren and Sue Morrison announced the addition of the James Lane dining and lounge range to their ultra modern looking store on Blaxland Road. Campbelltown mayor George Brticevic helped them cut the ribbon to launch the James Lane range. But the mayor also told a personal story that reflected the family approach and hard work ethic behind the success of the Morrisons. 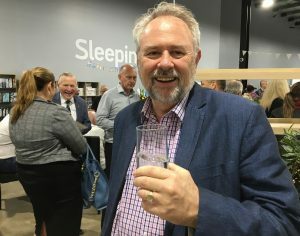 “I remember coming down here, to the kids section, on a Sunday,’’ Cr Brticevic told guests at last night’s celebration inside the Blaxland Road showroom. “I bought the Ned Kelly single bed, and Warren himself sold it to me. “I still remember he told me he’d been working seven days that week and wanted to get home to Sue – that it was beautiful. “Two years later I came back for another bed and saw Warren again. “So I saw how much work Warren put in and Sue with the family, the three kids, and the business as well and why it was so successful. “And when one of the beds we bought later for our new home had a few marks on it Warren himself popped in and touch it up. “How’s that for personal service. “But the business has also provided local people with local jobs – it also means they’re not on the M5. “Congratulations on the new store, it’s magnificent,’’ Cr Brticevic said. As a result of a major makeover, the Blaxland Road store now has a gleaming, industrial look with an open plan floor design. The store was closed down for part of this year while refurbishment took place while business continued in a temporary premises a few doors up the rosad. Work included an open plan design and a bright new industrial look replacing the previous warehouse style. Mr Morrison said the two keys to success for a retail business that also operated on weekends were “family and good staff’’. “We have done very well but these things couldn’t happen if it wasn’t for the support of the family, especially Sue my wife,’’ he said. “We have been fortunate to have had many wonderful people work for us over the past 21 years. 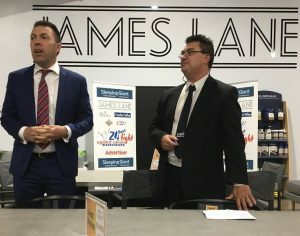 Guests last night included several Campbelltown councillors, business chamber president Glenn Greecy, footy legend John Skandalis and his wife Jodie, East Campbelltown league club chief Daniel Draper, Camden media man Terry Diomis, Duffy Law Group principal Patrick Duffy and Indigineous elder Uncle Ivan Wellington. Ian Fulton, of Aussie Home Loans, was among the guests. RIGHT: Sue and Warren Morrison with Cr Brticevic and staff, including daughter Ashley on the right. Happy 21st birthday, Sleeping Giant.